My wife and I are on a quest to find her 10 beers over the next 3 months that she can enjoy! We have found very few beers that she has enjoyed. 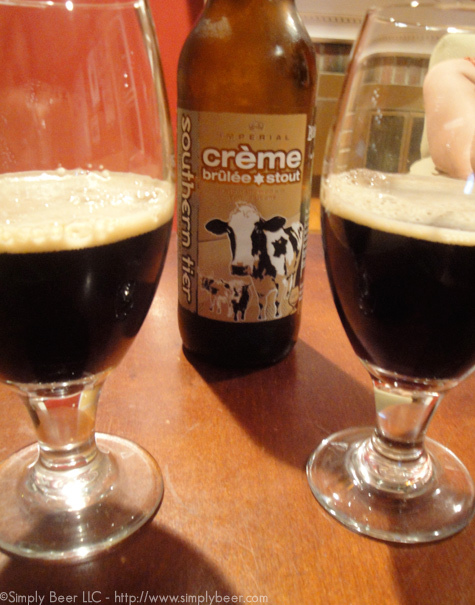 So tonight we sampled two beers, Southern Tiers Creme Brulee and Fantome Dark White. These are almost polar opposite beers, so I hoped by choosing such different beers, I could start to get a track on what is going to appeal to Dani. This beer was difficult for me to taste because I am not a vanilla person. The smell hit me like a ton of bricks and was so strong that it took me over 5 minutes and some coaxing to drink. It only took one taste for me to ask for put it down and never want it again….NEXT!!!! Wow, probably the worst choice I could have possibly made for the first beer to find 10 beers that Dani would like. This was way over the top sickeningly sweet aroma. I too had a hard time getting past the aroma. the taste was not my thing, once again overly sweet, sugary; way to much like a Cadbury creme egg. what we know is Dani is not a fan of overtly sweet. I’m with Dani on the Creme Brulee, NEXT! I wonder if Ommegang’s Chocolate Indulgence or Young’s Double Chocolate Stout should be ruled out? The observation right away — it didn’t take me over 5 minutes to try and get past the smell in order to drink it. This beer wasn’t bad but could use the help of hot wings and celery. Being almost 1 in the morning that’s not happening. I could probably drink this beer again. I taste the apple flavor but not the sweet sugar flavor. I’m not a fan of the beer to go flat so quickly bu that’s ok. I could drink this again as long as there’s food nearby. So that’s 1 beer down and 9 to go…just don’t bring me anything sweet like Creme Brulee again! The complete opposite of the Creme Brulee. This beer so exactly what I was looking for after the previous beer. Great aroma without being overwhelming, nice dry flavor with a tart apple flavor. I couldn’t have been happier with this beer. It was a wonderful surprise to actually see my wife enjoying a beer. Dogfish Head Red & White may be another alternative. I have found that if she likes sweet red wine she will enjoy a Framboise also a nice light Belgian Wheat beer or Hefeweizen works. Not blue moon though, go for the Hoegaarden. I also like the Southampton Double white but that may be a bit to strong. @Seth, I’m not sure if sweet is the way to go. right now, I still think I’m going to play around with the spectrum of beer. I think our next try may be a Hefe. @Bill, We’ll have to take a look at that. thanks for the Suggestion! thought that might be the case but threw it out there anyway. that was the first time I tried it and still love it. my other suggestion – if you are looking for any- is something from Lagunitas I personally haven’t tried anything from them that I did not love.